I guess we all need the silliness of groundhog day to make us smile. When February rolls around, it seems like spring should be here soon. The sun comes up earlier (around 6:30 now) and it's light until 5 in the evening. I find that even the birdsong sounds different. It's enough to lift your spirits after too much darkness. But we all know in these parts that it doesn't matter if the groundhog sees his shadow or not, there are still two months of winter left. In honour of St. Valentine's, I made a little wallhanging for my mother's door at the nursing home. She likes to have some decoration for each "holiday", so I oblige by making something for her. It's funny how green the door seems when in fact it's beige. At least the red looks red! I made myself a little zippy pouch to hold the various small items that I constantly misplace. I've had this fat quarter tucked away for quite a while, so it was time to do something with it. The lining is a whimsical dog print that was also in stash. Around here, February means logging. I'm not talking logging on an industrial scale, where everything is cut regardless of size, but the kind of sustainable logging that thins out the damaged and dying trees. The woods here are so dense that if you don't thin out the trees, no light can get through to encourage new growth and that's not a good thing. 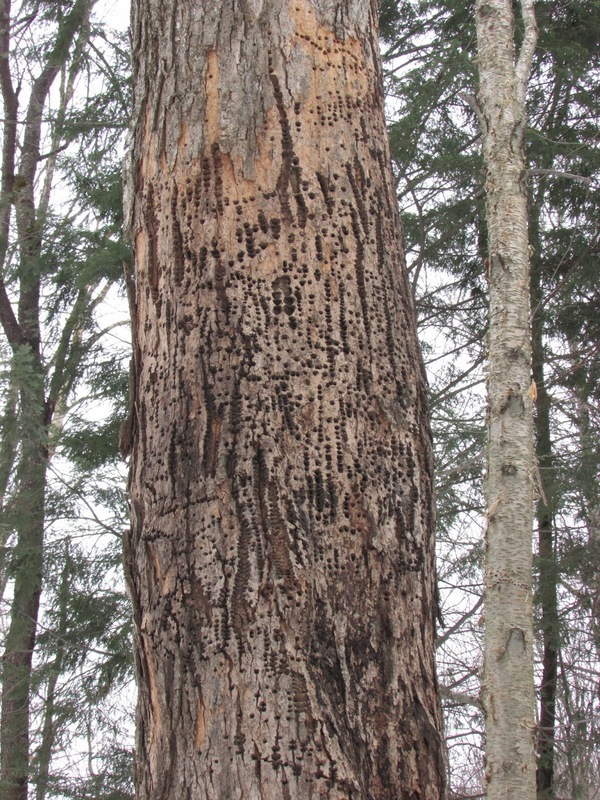 There are always trees that are dying, or rotten, or hit by lightning, or damaged by ice storms. Here's one that looked good until it was cut, showing it was rotten on the inside. This one is so old that it doesn't have many leaves showing in summer any more. It's probably rotten too. 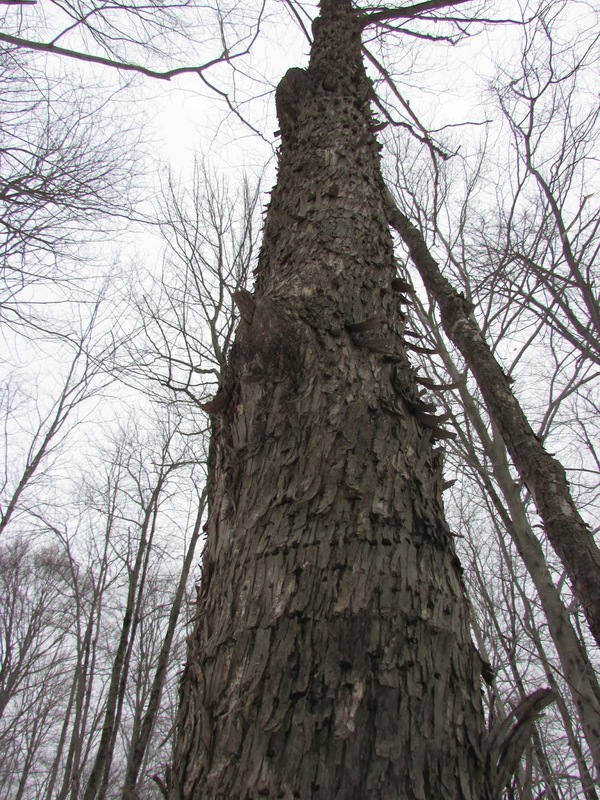 This one is full of small holes and looks like prime woodpecker real estate, so it will be left. Then after a while you end up with a barnyard that looks something like this. Time to call the log truck to transport them. I think these are all going for firewood. The trouble with logging with old equipment is equipment breakdowns. You can see the jaunty angle on the far side wheel --completely bent over! Neil's cousin had to drag the tractor out of the woods with the skidder, which wasn't easy. Our woods are very hilly and steep so it was white knuckle work until safely in the barn. Nothing some welding can't fix! And here it is two days later almost as good as new, or at least as good as a 40 year old tractor can be. It's a good thing to have a man who was raised on a farm and can keep any piece of equipment going. What a lovely and thoughtful gift for your mom! Great pouch too! love that fabric! Love your pouch. The Keep On fabric is great. So cute! Lovely wallhanging for your mom. Your mom must have the most compliments on her door decor. 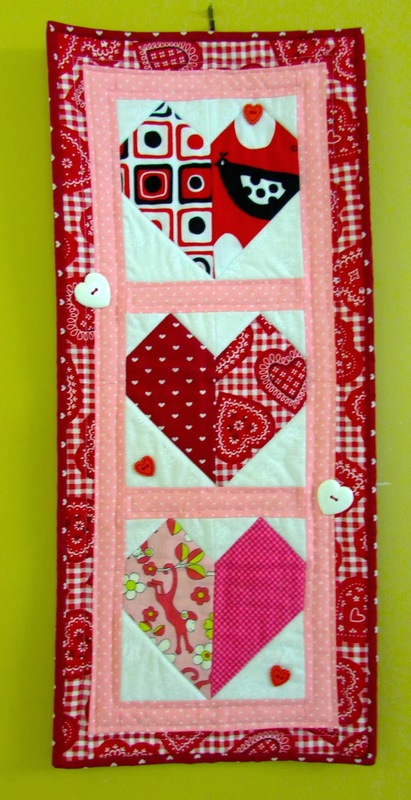 That is one sweet Valentine mini quilt! Love the pouch too. But what really caught my eye was the handy dandy rung for hanging the saw at the front of the ol' David Brown. Do you guys burn any wood? Oh, how sweet is that hanging for your Mom! I bet she loves it and it does add some fun and seasonal cheer. Your logging adventures remind me of my years growing up on a farm where we heated with wood. Glad you got that wheel fixed and ready for the next adventure! What a lovely wall hanging for your mum and such a great use of the keep calm fabric. I am sure your mom loves her wall hanging you made her! It is so cute and festive for Valentine's Day! Loved reading about your logging---Glad your tractor is fixed! Cute pouch! So what do you put in yours? Love the wall hanging - and that's a cute pouch, too. Yes, it's very handy having a man who can fix anything.